Blankets make kennels comfortable for a puppy. Potty training and protecting your home from puppy mischief are the primary reasons for crate training. The crate is not a prison, but a cozy comfort zone where your puppy satisfies his primal den instincts. Using positive reinforcement will have your puppy happily kenneled in a matter of weeks. Introduce your puppy to the kennel. Place the kennel in the room your family spends the most time in and remove the door. Place a comfy blanket and a chew toy inside the kennel to see if your puppy goes inside without other techniques. 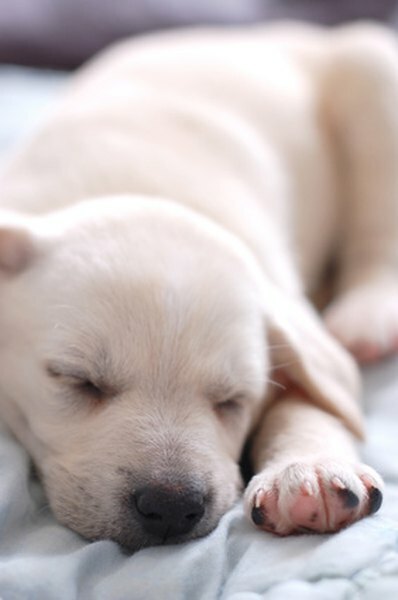 Some puppies will naturally start sleeping in a kennel, according to the Humane Society of the United States. Drop treats inside the kennel throughout the day. Puppies love to investigate their new surroundings and he will jump for joy to find a surprise waiting in the kennel. This helps your dog make positive associations with the new crate, according to the American Dog Trainers Network. Place meals within or next to the kennel. The food dish gets increasingly close to the back of the kennel for each follow-up meal until your puppy is fully standing inside the kennel to eat. Make the last meal extra good by adding peanut butter, chicken broth or treats to the dish with the regular food, according to the Association of Pet Dog Trainers. As your puppy is enjoying the meal, close the door of the kennel. Stay by the kennel and open the door as soon as your puppy is done eating. Create a command, such as “kennel time” or “crate time.” Call your puppy to the crate and give him a treat. Say the new command as your hold the treat inside the kennel. As your dog enters, enthusiastically praise him and shower him with treats. Leave the room for short periods of time. Once your puppy is calmly resting fully inside the kennel with the door closed, leave the room for 30 seconds and open the door when you return. Have the puppy return to the crate, close the door and then you leave the room for 60 seconds, according to the Association of Pet Dog Trainers. Continue to increase the increments until your dog is comfortable with you leaving the room for 30 minutes or more. Make a game of kennel training by hiding a treat in the kennel and telling your dog to “find the treat.” Excitedly praise your dog when he finds the treat. Keep departures to-the-point by giving a treat and then leaving. Prolonging the departure causes stress and frustration for the puppy, according to the Humane Society of the United States. Have your puppy eliminate shortly before placing him in a crate. A six-week-old puppy eliminates 8 to twelve times daily or more, so they can not stay in a kennel longer than 30 minutes. Hire a dog sitter or neighbor to take your puppy outside regularly if you're not home. Ignore whining and only let your puppy out of the kennel when he is quiet. Responding to whining or barking encourages him to continue these negative behaviors to get what he wants in the future. Do not crate a puppy in hot temperatures since this can result in heat stroke, dehydration or death. Do not crate a puppy who is vomiting or has diarrhea. Never punish a puppy by locking him in a kennel since the puppy will grow fearful and have negative associations with the kennel. Do not force your puppy into the crate since this prolongs the process by making your puppy fearful.